AG14361 is a potent inhibitor of PARP1 with Ki of <5 nM. The solubility of this compound in DMSO is > 16 mg/mL. General tips for obtaining a higher concentration: Please warm the tube at 37 ℃ for 10 minutes and/or shake it in the ultrasonic bath for a while. Stock solution can be stored below -20℃ for several months. AG14361 at concentration of 0.4 μM inhibited the activity of PARP-1 by more than 85%, but it had no effect on cancer cell gene expression or growth. AG14361 increased the antiproliferative effects of topotecan and temozolomide, inhibited LoVo cells recovering from γ-radiation damage. Mice were treated with AG14361 a day before implantation of ES cells and continuing for 9 days. The formation of BRCA1-/- ES derived tumors reduced by 90% comparing to control group, but the formation of BRCA1+/+ ES tumors reduced only 22%.
. Calabrese C R, Almassy R, Barton S, et al. Anticancer chemosensitization and radiosensitization by the novel poly (ADP-ribose) polymerase-1 inhibitor AG14361[J]. Journal of the National Cancer Institute, 2004, 96(1): 56-67.
. De Soto J A, Wang X, Tominaga Y, et al. The inhibition and treatment of breast cancer with poly (ADP-ribose) polymerase (PARP-1) inhibitors[J]. Int J Biol Sci, 2006, 2(4): 179-185. PARP1 is a member of PRAP family and plays an important role in many cellular processes, such as DNA repair, programmed cell death. It has been revealed that PARP1 is abnormally expressed in a variety of cancers and many PARP inhibitors have been developed as the anti-tumor drugs   [3, 4]. 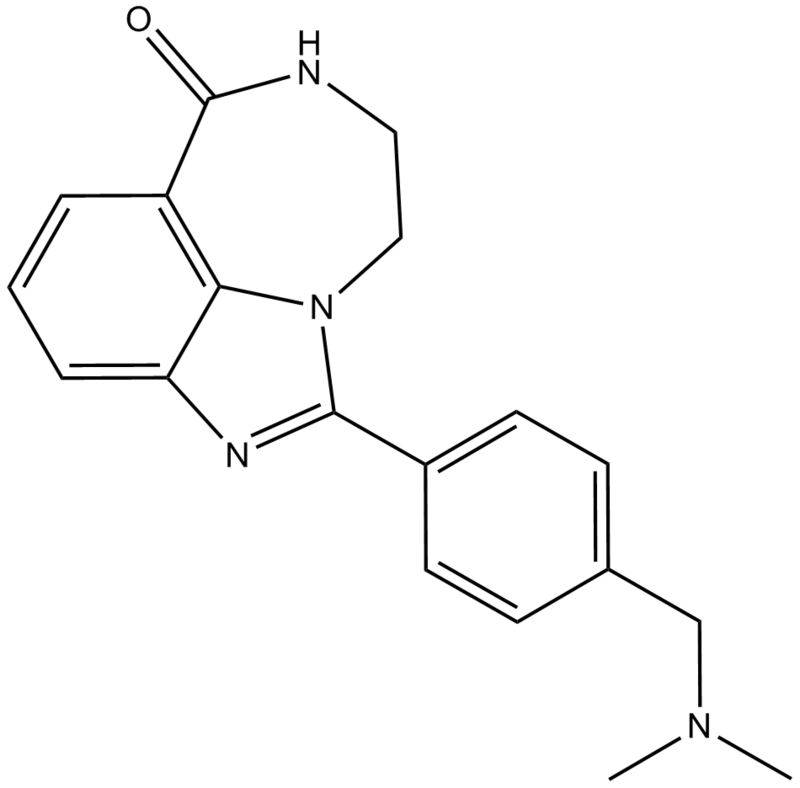 AG-14361 is a potent PARP-1 inhibitor. When exposed HR and BRCA2-defective cells and parental cells to AG-14361, HR-defective cells were hypersensitive to the AG-14361 even at non-cytotoxic concentrations and lacking BRCA2 made the cells more sensitive to AG-14361 . 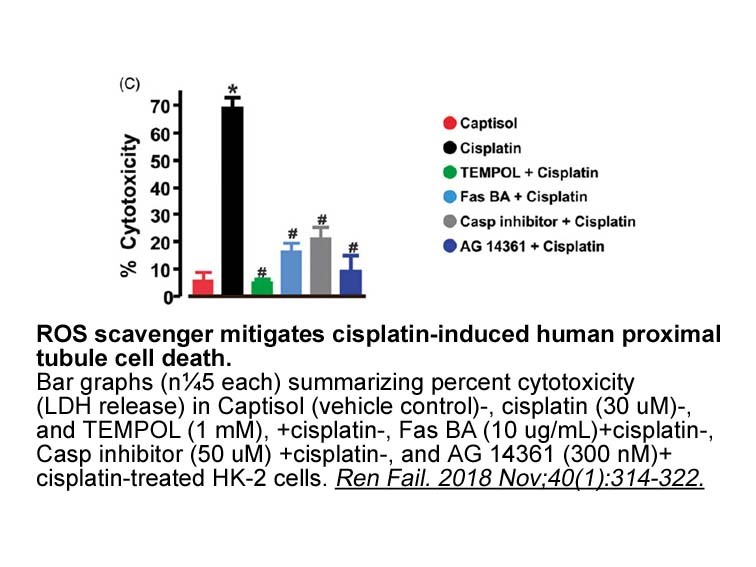 In human K562 cells, AG14361 treatment for 16 hours resulted in significant (~2-fold) potentiation of camptothecin-induced growth inhibition (GI50, 16 hours, camptothecin + AG14361 2.4 ± 0.1 nmol/L), cytotoxicity (LC50, camptothecin + AG14361 2.77 ± 0.55 nmol/L) and DNA single-strand breaks via inhibiting PARP-1 . When tested with MMR-proficient (HCT-Ch3, A2780, and CP70-ch3) and MMR-deficient (HCT116, CP70, and CP70-ch2) cells, MMR-proficient cells were more sensitivity to temozolomide compared with MMR-deficient cells after exposed to AG-14361 which inhibited PARP1 activity . In mouse model xenografted with BRCA2-deficient and BRCA-2 proficient tumor cells, BRCA2 deficiency group had more response even completely regressed tumor compared with BRCA-2 proficient group when treated with AG-14361 .
. Smith, L.M., et al., The novel poly(ADP-Ribose) polymerase inhibitor, AG14361, sensitizes cells to topoisomerase I poisons by increasing the persistence of DNA strand breaks. Clin Cancer Res, 2005. 11(23): p. 8449-57.
. Curtin, N.J., et al., Novel poly(ADP-ribose) polymerase-1 inhibitor, AG14361, restores sensitivity to temozolomide in mismatch repair-deficient cells. Clin Cancer Res, 2004. 10(3): p. 881-9.
. Calabrese, C.R., et al., Anticancer chemosensitization and radiosensitization by the novel poly(ADP-ribose) polymerase-1 inhibitor AG14361. J Natl Cancer Inst, 2004. 96(1): p. 56-67.
. Kyle, S., et al., Exploiting the Achilles heel of cancer: the therapeutic potential of poly(ADP-ribose) polymerase inhibitors in BRCA2-defective cancer. Br J Radiol, 2008. 81 Spec No 1: p. S6-11.